More than 13,000 Arab and Muslim men in the US are facing deportation after co-operating with post-11 September anti-terror measures, it has been revealed. They are among 82,000 adult males who obeyed a government demand to register with the immigration service earlier this year, on the grounds they come from 25 mainly Muslim countries said to harbour terror groups. Only 11 of those who registered, and of the tens of thousands more screened at airports and border crossings, have been found to have links with terrorism. The vast bulk of those facing deportation proceedings were found to have lapses in their immigration status. By co-operating fully with the demand to register, many had hoped to be treated leniently. But the immigration service - which faced a backlash after several of the 11 September hijackers were found to have been in the country illegally - says enforcement is now a top priority. Correspondents say families in immigrant communities have already started packing up to leave the country, while others are simply going underground. Officials told the New York Times that more than 600 Arab and Muslim illegal immigrants were deported during the first wave of expulsions after 11 September. But the Department of Justice stopped releasing figures after the number of arrests reached 1,200, says the paper, and no complete statistics are now available. Last year authorities launched a drive to track down those already served with deportation orders, in which more than 3,000 arrests were made. But this third sweep for illegal immigrants seems set to produce the largest wave of deportations: 13,354 at the last count, compiled by American newspapers. "There's been a major shift in our priorities," Jim Chaparro told the New York Times. He is acting director for interior enforcement at the Department of Homeland Security - which has now absorbed the old immigration service. "We need to focus our enforcement efforts on the biggest threats. If a loophole can be exploited by an immigrant, it can also be exploited by a terrorist," he said. But critics say the latest crackdown on immigrants is unfair and racist. "People did register out of their good conscience, because they wanted to follow the rules, respect the law," said Fayiz Rahman of the American Muslim Council. He says the policy is "targeted only toward Muslims. "This is a major concern. They are planning to reduce the number of Muslims on American soil... discourage Muslim immigration, make our lives difficult." Other critics say some of those awaiting deportation had only violated immigration rules due to a backlog in processing of applications by the government. Added to the controversy is a report released by the Department of Justice on Monday, which found "significant problems" in the way many immigrants arrested after the 11 September attacks were treated. Many were chained, physically and verbally abused, held without bail and denied access to lawyers, says the report, according to news agency AFP. But immigration officials defend the clampdown on immigrants. "We get criticised every day for not following through," said Bill Strassberger, spokesman for the Bureau of Immigration and Customs Enforcement. "We can't have a legitimate immigration system if we allow people to come and just do what they want. It's not fair to those who do comply with the rules." My Fiancée is awaiting notification of approval to enter the United States to be married. She is Maltese and abiding the law in doing this. What took 60-90 days before 9/11 now takes 150-180 days. By the end of this we will have been apart for six months, and spent a lot of money in our efforts to bring her here and marry. We don't blame the United States goverment, we blame the people who use the Muslim religion as justification to attack and kill innocent people in the USA. So quit your whining about being the only ones to suffer due to Muslim terrorism. The INS is 100% correct and within the laws of the United States. Immigrants in the United States are "guests", many of whom have overstayed their welcome. If you are in our country illegally, we are within the laws of the United States as well as international law by deporting you. The immediate effects of such a harsh INS clamp-down will be a loss of hard-won civil rights and basic decency. The long-term effect will be a slow-down of our economy. One of our country's engines of growth is the size of the population. Our population grows both by natural birth rates and by immigration. With the INS clamping down on immigration, both legal and illegal, many immigrants will not want to come here. Add to this mix the rising star of the EU. We may find that the EU, not the US, will enjoy the next wave of prosperity that follows behind every wave of immigration. Tens of thousands of people co-operated with authorities in good faith. 11 of them had some connection with extremists. The US is now expelling many who did what was asked of them. Their good faith has been repaid with deception. How many of these moderate, generally law abiding people will turn to extremism? How many more will see this and say "The US is unfair and unjust?" To say that Muslims are the only group attacking the US is very wrong. What about Timothy McVeigh (Oklahoma bombing) ? Was he a Muslim? The immigration service is doing its job by deporting illegal immigrants from the US. I think most people accept this as a risk when entering the country or staying on illegally. However, it is appalling that Arab and Muslim communities alone are being scrutinised. "To protect a few, many will suffer". Any real terrorist will be able to enter a country outside of the usual legal channels, thus how effective is this policy. It will lead to racism & xenophobia. Muslims should stop whining and work toward real reform of their religion. They are headed for a clash of civilizations - and clearly with their fundamentalist side bent on living like 7th century zealots - they haven't got a prayer against the USA. I agree that anybody that is illegal in a country and/or has terrorist ties (or intentions) should be deported, or imprisoned and punished; no matter what. I am a British citizen. I immigrated to the USA nearly four years ago after following the rules. It took time, money, patience and as I was marrying a US citizen, a large amount of pain when we were apart. I am glad they are clamping down on the people who sneak in, or sneak through a loophole. If I and so many others have to suffer, work, wait and so forth, then they should too. This disgusting action is another step in the ever-increasing chain of events that are leading to US fascism. How can people be so blind as to actually excuse mass deportations and arrests based solely on race or religion? Comparisons of the Bush regime to the early Nazis are in order. America's true colours are coming out of the 11 September backlash. Since the real terrorists are out of reach, it needs to create some fake ones to show the public it is doing something. I am not surprised by any of these INS detentions, but concerned that the nation's ideals are falling off the roof before anyone has the guts to stand up to protect and defend those. Nowadays anything goes in the name of fighting terrorism. How does that make us better than terrorists? I'm in complete agreement with these immigration officials. I had to jump through masses of hoops to come to the US, legitimately married to a US service member and I'm a British citizen! I have no time or patience for those who exploit loop holes in the system or arrive illegally without proceeding through the correct channels. Attitudes clearly demonstrative of religious and racial exclusivism are readily evident in both government policy and mainstream media treatment of Arabs and Muslims in the USA today. Those of us here in the USA who work in the field of interfaith relations are increasingly concerned as our federal government, ostensibly pursuing a global war against terrorism, seems to be slipping and sliding toward religious fascism here at home. I am a natural born citizen who is disgusted with the way the INS treats many who walk through its doors. They are horribly understaffed and that translates into a backlog that lets good people trying to make a better life for themselves and their families into a door to government red tape. 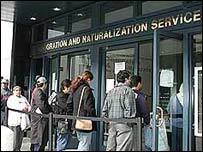 If the US government wants to do things correctly they should hire more people to process paperwork and answer phones to help new immigrants instead of spread fear through immigrant groups. This country was founded on immigrants and it constantly amazes me how many people that claim to be Americans forget that someone in their family was once an immigrant themselves. The events of September 11, 2001 affected each and every person living on the planet, most particularly Americans. Clearly every nation on earth has the right to regulate those who enter through its borders. Since those who chose to attack us are Muslims, the Muslim community must expect closer scrutiny. As an American Muslim I am increasingly worried about my country's tactics. Just a few months back I had a relative coming to visit me on a legitimate visa which we had a lawyer ensure complied with American law. Unfortunately, our lawyer made a small mistake which we were unaware of. At the airport the INS officers realized that the lawyer made a mistake. While the supervisor was understanding, his subordinates were cruel, and condescending in their behaviour. My uncle was detained, not allowed to speak to anyone and prevented from taking his medicine (he is a cardiac patient). Not only that, but the subordinates had the gall to suggest that he was not ill (they said he would be lying on the floor if this was true), and that he could spend the night in jail and not worry about a hotel. He was forced to buy a hideously expensive ticket to return home. This is not the America that I grew up in.